A question came up on www.askart.com about an H. Lewis painting of a Scottish Soldier. I wrote to the poster to get a photo of the painting and the signature, as well as get more information. 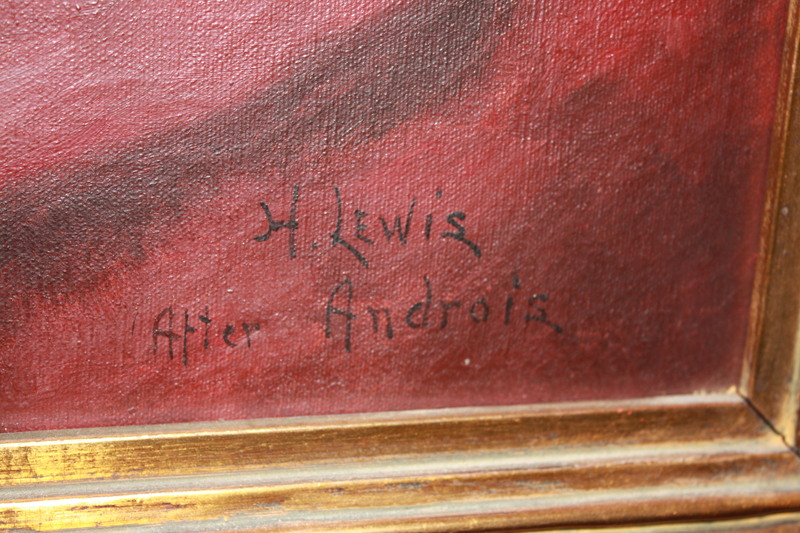 DC Slate emailed me with photos, and noted that the signature read “H Lewis Alter Androis” or maybe “H Lewis After Andreas”, she asked if I had any idea what that meant. A while ago I had seen an H. Lewis work which had the “after” and then a name as well as Hubert’s signature, but not being an expert on art I consulted my cousin, Julie Rogers. Julie explained to me that “after” refers to the style of the other artist’s name. I researched the name with the painting, and came up with Alex Androis, which then led me to Alex de Andreis. I believe de Andreis to be the correct artist, as there were many paintings with the same style of dress and color done by him. The paintings were of Cavaliers or Muskateers. According to artnet.com, de Andreis was a British artist, living from 1880-1929, while christies.com has him as a Belgian, living 1871-1939. Either way, he would have been an artist at the time my great grandfather Hubert Lewis was working as an artist. According to DC the oil painting is in mint condition and is 30 by 37 inches. It is a beautiful work. This entry was posted in The Art and tagged 19th century art, 19th century artist, American artists, Androis, Apollo, de Andreis, Fine art, H Lewis, H. Lewis art, H. Lewis artist, h. lewis signature, H.R. Lewis, Hubert Lewis, Hudson River School, Kim Lawler, Pennsylvania. Bookmark the permalink. 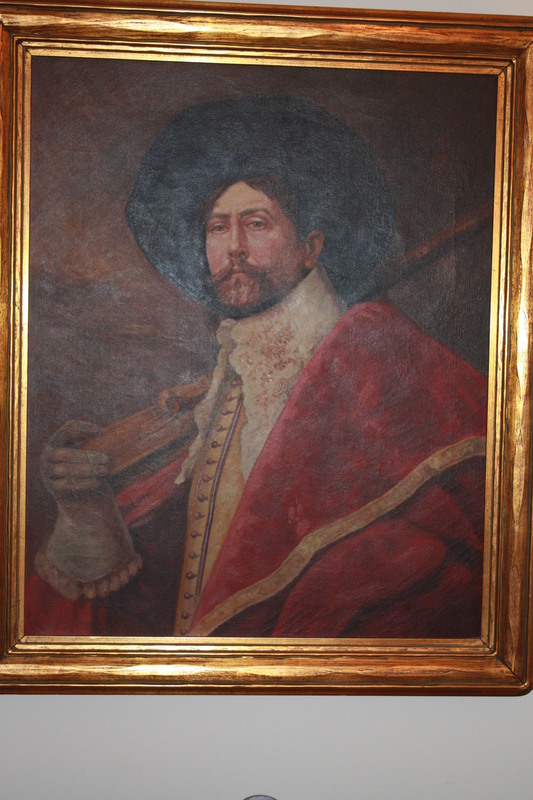 I too have a very old print of this cavalier that my Grandparents had in their farmhouse in Chester, MA for 40 years. It’s now been in my home for 20 years. The signature at the top right corner is Alex Androis, no mistake about that. I see the one above has no signature at the top right. Art experts keep pushing this topic towards Alexis de Andreis who was an obvious fan of cavaliers. If de Andreis was the correct artist, why would the signature be Alex Androis? Perhaps there was an artist (Androis) with a similar name and style to de Andreis, who wasn’t as popular and isn’t listed in books, etc? Or maybe Andreis’ ‘e’ look like ‘o’? I really don’t know. Obviously your print signature is spelled the same way my great grandfather spelled the name on his painting, but I have no extra information. Sorry about that. I guess it remains a mystery for now. I have the original Alex De Androis of this exact painting, though I believe he did several of these. Oil on canvas. Your great-grandfather did a fine job! Thank you! I’d love to post photos of your original de Androis painting along side the replica of Hubert Lewis’s. If you are willing to let me post, either with or without your name attached as the owner of the painting, please send me a few good photos of the painting and signature to ksnazzy@comcast.net. Thank you writing!